RKNet Studios is using the highest state-of-the-art in video equipment in production and post-production of the upcoming Bollywood movie Pyar Mein Kyun. April 16, 2012 - PRLog -- RKNet Studios, the producers of the upcoming Bollywood movie Pyar Mein Kyun have shot the entire movie using RED One Digital Cinema Camera. RED One shoots Ultra High Definition 4k images that are five times higher resolution than all previous HD cameras and is what the big-time Hollywood movie producers and directors use for their blockbuster box office hits. Some of the famous Hollywood movies shot with RED One include: Pirates of the Caribbean, The Social Network, and Contagion. The camera is unique because of the ultra high definition quality, dynamic range and file output in RAW format that is essentially digital film. Shooting on RED at 4K allows for delivery in several format resolutions from the same footage. Output can be 4K, 2K, HD 1080, HD 720, SD and even vertical HD for digital signage. Because the creative freedom in post-production is limitless it is ideal for both cinematic images and special effects. The camera sensor, called Mysterium-X, is 4.5K megapixel bayer pattern CMOS 14 bit sensor which is rated at ISO 800 at daylight with a dynamic range of 13.5 stops. It has approximately the same surface area of a traditional Super 35 film frame masked to the 1.85:1 aspect ratio, creating a similar angle of view and depth of field as the Super 35 film format. 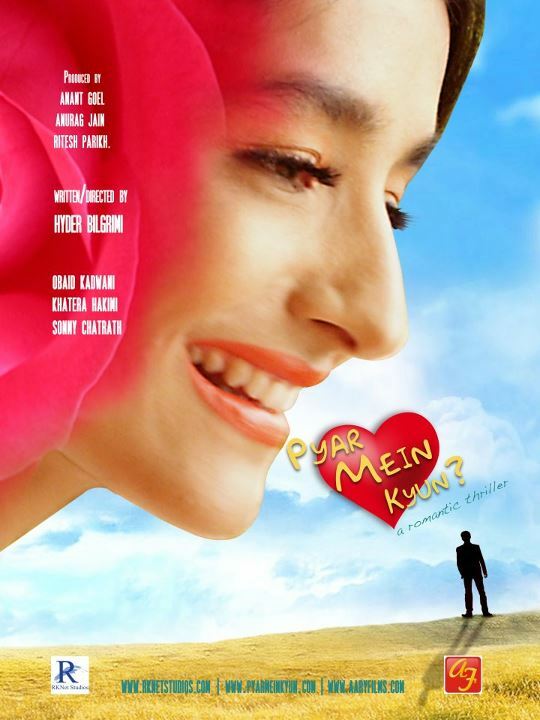 Created by award winning film writer and director Hyder Bilgrami, the movie Pyar Mein Kyun http://www.pyarmeinkyun.com is a classy romantic love story with twists and turns that provide drama, entertainment, mystique and a thrilling experience. The star cast of this much anticipated Hindi movie includes actors Obaid Kadwani and Khatera Hakimi, with Sonny Chatrath, Deena Safi, and Michael Dean in supporting roles. The new song promo is available on YouTube. RKNet Studios is producing new generation digital media films using the universal language - the body language, in the tradition of Bollywood and Hollywood. They are utilizing global talent with local resources to produce full feature films for audiences world-wide. The language in their movies is Bollywood Hindi and English, with English and Spanish subtitles, but, what's so intriguing is the director's focus on the use of the universal language, the body language. Hollywood movies can take the age old story of love between a man and a woman in the most intriguing and authentic manner to produce one box office hit after another, and the movie Pyar Mein Kyun is as authentic in its story and storytelling. It is the story of 2nd generation South Asian love, romance, heart-wrenching deception and drama between an older man and a 19 year old girl in our globally connected and socially networked generation. Sometimes things are not quite what they seem! RKNet Studio films are aimed at younger audiences worldwide - over 500 million English-speaking South Asian middle class - that are looking for more spice from Bollywood. However, they are not making mythological movies that are fabulously unreal. They're just keeping it real, entertaining, and thrilling. RKNet Studios is in the business of producing, marketing and distributing digital media content including full feature films for the 17+ age group around the globe. The company is positioning itself to offer comprehensive range of creative, technical, financial, promotional, marketing, distribution, and trading support to its clients, as well as, utilize these in-house resources in the production of full feature films for global distribution.